World powers have been in talks to begin lifting UN sanctions against Iran if a deal is reached in upcoming nuclear discussions, media sources said. A UN resolution would make the deal binding, bypassing recently voiced objections in the US Senate. 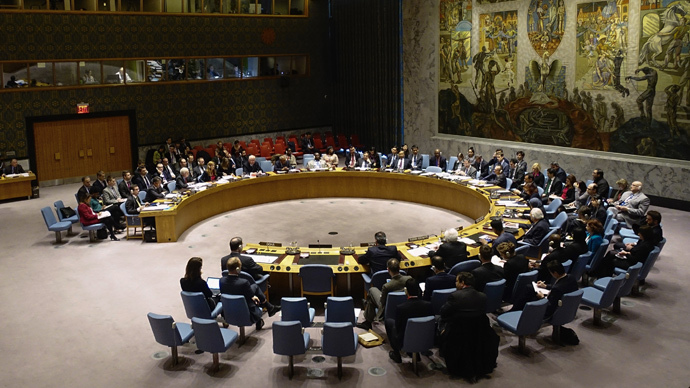 The P5+1 group, consisting of the five permanent members of the UN Security Council (Russia, China, France, Britain, and the US) plus Germany, has been discussing a draft resolution to begin relaxing UN sanctions on Iran, an unnamed Western official told Reuters on Thursday. The sanctions were imposed in 2006 over Iran’s alleged attempts to weaponize its nuclear energy program. The revelation comes amid a war of words between the White House and Senate Republicans over a letter that 47 senators sent to Iran on Monday, warning Tehran that any agreement not ratified by the Senate could be revoked under the next president. Iran’s Supreme Leader Ali Khamenei condemned the senators’ letter, saying the “other side is known for opacity, deceit and backstabbing,” Mehr news agency reported. Washington was looking for a “non-binding” agreement rather than a full international treaty, because that would give the US “flexibility to snap back sanctions” if needed, State Department spokeswoman Jen Psaki told reporters. She refused to address the question of whether this represented an attempt to bypass the Senate. A UN Security Council resolution would be legally binding for Washington, making it more difficult for Congress or the next presidential administration to undo any agreement that might be reached with Iran. “The best way for us to resolve international community’s concerns about Iran’s nuclear program is to get Iran’s own commitment to not develop a nuclear weapon,” said Earnest. Little is known about the proposed deal, but State Department and White House revelations over the past several weeks indicate that it would allow Iran to develop a civilian atomic program under strict supervision, which would make it very difficult to build a nuclear weapon. Israeli Prime Minister Benjamin Netanyahu opposed the deal in his address to the US Congress earlier this month, further souring relations between legislators and the White House. Talks on Iran's nuclear program are scheduled to continue in Switzerland next week.